Coming off the successful earlier series THE BLETCHLEY CIRCLE, our heroines Millie (Rachael Stirling) and Jean (Julie Graham) are back for a second series where they get caught up in an investigation into the death of a friend who died 14 years earlier. In the intervening 4 years since the war, both Millie and Jean are feeling a bit unsettled and seek to be able to contribute more with their newfound intelligence and investigative skills. So it is too enticing to ignore when another women’s dead body turns up, albeit in San Francisco, who appears to have died in a similar manner. In an exclusive interview, showrunner Michael MacLennan and director Alexandra La Roche talked about the fun of bringing back Millie and Jean back for another BLETCHLEY CIRCLE mystery and adventure. 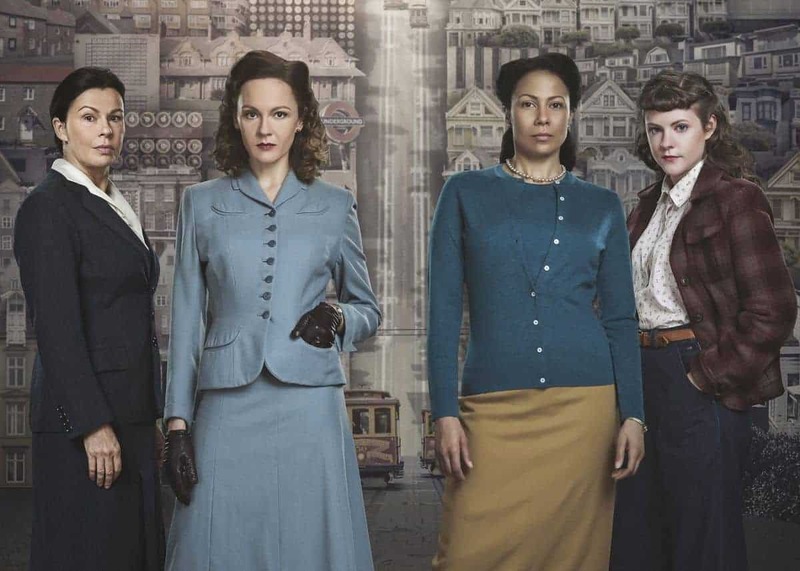 I had the opportunity to preview your new series of THE BLETCHLEY CIRCLE: SAN FRANCISCO. I loved the first series and I’m looking forward to seeing more of the second series. Maybe you can just talk about why it was time to revisit this particular story with these characters. MICHAEL: It’s a show that’s set in the mid-50s. This is a time of the beginning of modernism. The beginning of a lot of that post-war exuberance that’s sort of carried us through to today, and I think it’s a time where we’re really questioning a lot of the tenants that have informed life in North America over the past 50 so years. So it’s interesting to go back to a time when those values were first being carved out and understood and expressed. Values of equality, civil rights, racial equality, the beginning of transformation of urban life. So it is a way to sort of explore some of those themes and wrap them up, and of course, the beginnings of the early women’s equality movement as well — and those things that are being question, being called into question today and to just sort of see how those things were involved in its early stages — and it’s wrapped up in really fun mysteries with wonderful characters. So that was kind of our feeling why the world needed more Bletchley at this point. It seems interesting that in both of these cases, maybe it was done intentionally, that these are women take note that it is ‘crimes against women’ that are not being pursued by men — that men are just kind of sweeping these crimes under the carpet. Is that kind of like a subliminal message you’re kind of sending out there — that crimes against women haven’t been pursued and investigated as thoroughly as crimes against men? MICHAEL: Thank you for recognizing that. I mean, first, of course, there’s always that. You’ll see in different episodes this week, as it continues, that’s not always the same issue. But we wanted to sort of talk about a ‘crime against women’ that didn’t feel like the typical teaser of a CSI-episode where something terrible is happening, but where you don’t understand the fallout of what the crime is emotionally and for the people who are around the victim. The reason why these women succeed is because they are underestimated themselves. People will talk to them and share information with them because they don’t imagine that they have any capacities — that they are constantly underestimated in terms of their intelligence and capacities — and that the nature of the crimes that they tend to solve are those that sort of live in the shadows of the city. That aren’t of interest or seem to have the same kind of value. That is very much an important thing for us, and you very much picked up on that on our first mystery. These women are underestimated. It’s a lot of fun to see them getting a chance to act as investigators even if they are being underestimated. They are still incredibly confident and shrewd and very insightful. It’s nice to see all those things being portrayed in women characters, onscreen. ALEXANDRA: I think that’s why the Bletchley, the reboot, those characters were so bigger than life than in the first series. You just wanted to see more of them. The two characters we’ve brought into this series are two that we didn’t know much about their personal lives in the original series. Getting to explore that even more, it’s a great opportunity. Maybe just talk a little bit about more Millie and Jean. Why them? Why taking them to San Francisco? MICHAEL: In a way, Millie and Jean are the two that are the most ready for change. They’re the two that don’t have families. They aren’t married, they aren’t mothers, and they’re very different otherwise. One is more worldly, one is more cautious. Jean is, of course, a very cautious person. But they’re the two who have an appetite for change who are looking to find more meaning in their lives. Of course when we meet them they’re in different ways. They’re sort of feeling frustrated in their attempts to create more for themselves in their lives, and there’s a bond between them. I mean, I think it’s very true to a lot of women in the war that because of the war, it brought so many different women together. Millie is from an upper-crest family, and Jean is from a very humble Presbyterian life and, were it not for the war, they would never have met each other, let alone become fast friends, and there’s a lot of thinking that talks about how the war on both sides of the Atlantic was really the beginning of why the feminist movement could take off because it allowed women to start to connect in ways they hadn’t before. So here are two women who, put them together, and they’re a formidable duo — not despite their differences, but because of them. And we just felt they were the two most interesting characters in there because of their contrasts, and we were just excited to see how they would respond to a new world. And seeing San Francisco, we’re showing the world San Francisco in the 50s, but we have the added bonus of seeing through these two wonderful character’s eyes as they take it in for the first time. There certainly is a whole new world awaiting for them and it’s totally different. MICHAEL: Yes, it really is, and there was many a time where we were sort of tempted to really play that up and we have a few little moments here and there in each episode but we didn’t want to totally turn this into just a ‘fish out of water’ kind of story. But, as we said before, it’s like visiting the future. You’re leaving a war-torn country in the 50s. They still had rations just two years earlier. It’s the mid-century modern. Sso just reveling in that is a wonderful part of the show, I think. It is actually with this interesting contrast as you introduce in two additional women into the story: Iris [Crystal Balint] and Hailey [Chanelle Peloso], and it kind of makes another quartet situation. Why did you feel like you wanted to introduce two other characters that we hadn’t met before into this mystery story? MICHAEL: It was to explore the cryptography works that happened on the American side of things which were mostly pointed to Japanese code. It was a very different experience. It required very different thinking and just wanted to sort of bring that kind of cryptographic kind of capacities and marry those with the way that the folks at Leslie’s Park did, so it’s like sort of two different mindsets really and two different cultural approaches. ALEXANDRA: But at the same time you get this incredible opening between the women culturally — on the one side, the American women, and we have an African-American urban woman, and the other girl, Hailey, is more of a farm girl who’s mechanically minded, engineer minded as it were. Putting those two together with the two British characters that we already know, you have these wonderful foils to each other both culturally and, of course, in terms of what they’ve experienced as women and watching these women interact and form a bond and put a lot at state to support each other. It does feel like the beginning of the women’s movement as you watch these women interact and grow together. It’s part of the joy of the series, I think. MICHAEL: I think that’s one of the pleasures of the show: watching women build each other up. They’re literally building on each other’s ideas. They are being inspired by each other. They’re gaining courage and resolve from each other and it’s a dynamic that sort of flies in the face of the idea that it is about competition or mistrusting of one another that, in this case, it’s a really powerful alliance, and the reason why they’re able to accomplish all they do is because of the trust in those strong bonds. I wanted to let you know how much I appreciated you bringing back the story of THE BLETCHLEY CIRCLE. I’ve been fascinated by it — learning how much women did contribute to both the war effort and what they were able to do with their lives afterward with those skills. MICHAEL: That was one of the things that’s struck us when we have met women who have done this, who are in their 90s now — they were never able to tell people what they did, and most of them took it to their graves. So I think it’s a wonderful thing to sort of celebrate an unsung and very important part of history. THE BLETCHLEY CIRCLE: SAN FRANCISCO is currently available for online viewing and streaming on BritBox.